ESPN calls the CooperstownExpert collection, “One of the most comprehensive Hall of Fame collections outside of Coopertown. The collection is home to autographs of all but three MLB Hall of Famers who debuted since 1900. This site is dedicated to the display and explanation of the collection. CooperstownExpert.com is not solely about autographs. Make your way to the Babe Ruth player page and read first-hand accounts of the “Called Shot” in the 1932 World Series, click on the Stunning Stories category on the home page and find the post on Barry Bonds. There’s something for everyone. 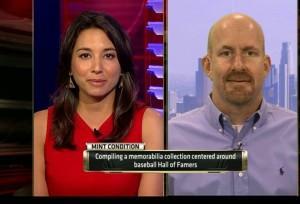 In the video above, ESPN interviews lifelong collector Jim Smiley. Jim and his collection have been profiled on the internet, radio, television, podcasts, and newspapers coast to coast. We hope you enjoy your time spent at CooperstownExpert.com.